A completely new satellite navigation and parallel driving system with superior performance, providing precision at the level 15 cm from pass-to-pass. Forget about using foam markers and spending of own time. 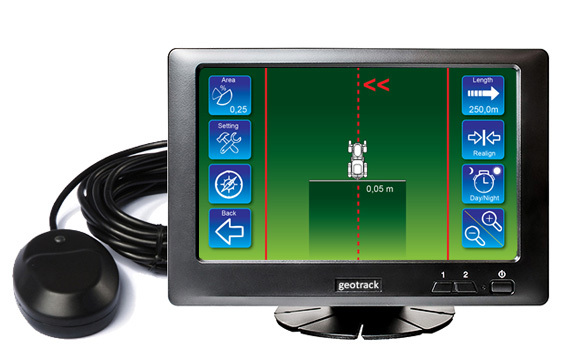 GeoTrack is designed to work with wide cut implements. Intuitive menu, a comfortable setting. Set the width of the implement and click start. From this moment GeoTrack Explorer is ready for work. Includes all necessary mounting for quick installation. 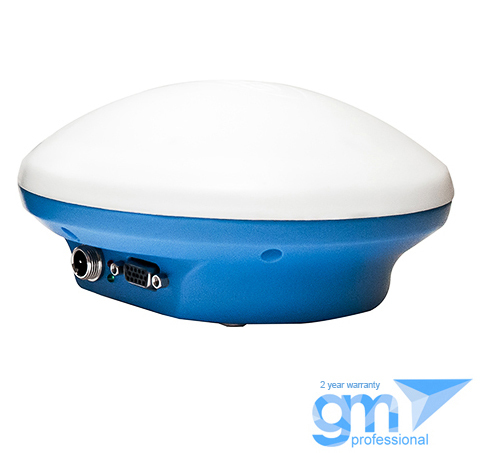 The antenna is mounted with durable magnetic fastening. 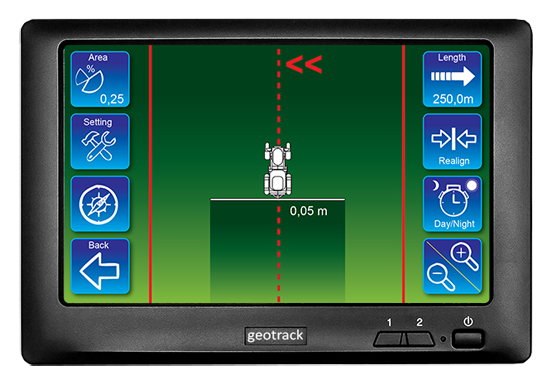 System GeoTrack Explorer is based on a durable and protected from dust and moisture display with image size of 7 inches (17.8 cm). The vibration-proof holder completes the set for maximum comfort. All information is displayed on an extra bright screen and it is perfectly readable even on bright sunny day. High resolution screen guarantees the visibility of a clearer picture. Night mode is provided. GLIDE technology provides an excellent accuracy for use with agricultural machinery, where the relative positioning is critical. The system can operate without a base station and access fee. Reception of correction signal EGNOS, WAAS, MSAS. Upgradeable for reception of GLONASS (DGNSS) signal. Precision of parallel driving from pass to pass at the level of 15-20 cm. Inexpensive solution for field work: tillage, spraying, harvesting. 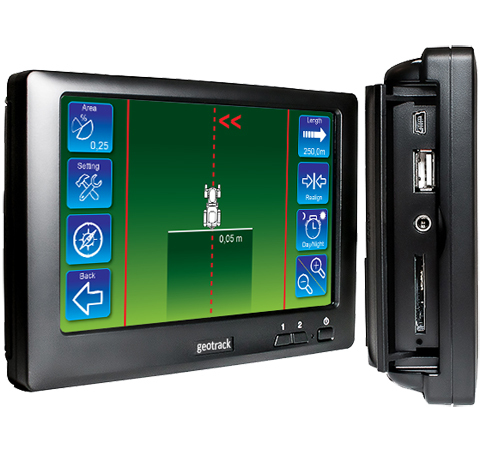 Standard completing units of geotrack explorer system includes patch GPS receiver configured for update rate 2 Hz (2 times per second). On preliminary request, the receiver can be reconfigured up to 5Hz. This update might need to perform agricultural work at higher speeds. The system operates without a base station and subscriber fees. Receiving of the correction signal EGNOS, WAAS, MSAS. 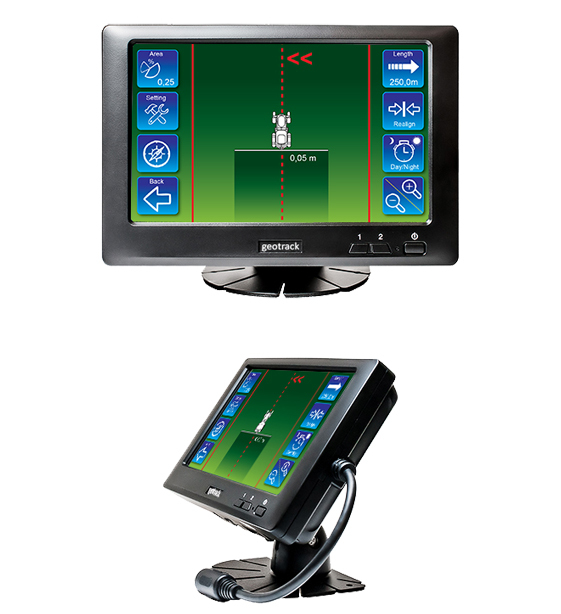 The accuracy of parallel driving system from pass to pass at the level of 25-30 cm. Shipping is done through international airmail. Depending on the country / region the kit will arrive within 5-7 days after ordering. You will need not more than 15 minutes to install it. To contact us, use the contact form below. Your message was sent! We will contact you shortly! *Incorrect name. *Needs to be filled. *Incorrect email. *Needs to be filled. *Message is too short. *Needs to be filled.